The first time I went to the fish bar, I watched a middle-aged salary man take a seat at the bustling counter. He took out a pack of cigarettes and lighter, loosened his tie, rolled his neck and shoulders working out the kinks of the day. He gazed around the room reading the specials, scrutinizing what the other diners were eating. Catching the counter-woman’s eye he reeled off a short order. He poured himself a glass of beer, took a long pull and breathed a sigh of contentment. A plate of grilled yellowtail collar was placed before him. He opened his chopsticks, closed his eyes with reverence, mouthed a simple prayer and simply attacked the dish with the precision of a surgeon. Within minutes he was transformed and looked ten years younger. Whatever toxic stress he brought in with him was drained away, a psychic puddle at his feet. This was what he had waited for all day, maybe all week, maybe all month: to be surrounded by happy eaters, drinking a cold beer and have a perfectly grilled piece of fish at the end of his chopsticks. He swayed a bit, his plate now an array of stripped bone, wiped his forehead with a towel and with a beatific smile ordered a barrage of dishes. If there was ever a full-proof escape from the stress of everyday life, it may well be the Fish Bar, real name: Uosan Sakaba. For around 50 years, it has operated a block or two away from the Morishita Station in downtown Tokyo. Each morning the 74-year-old owner heads to the sprawling Tsujiki fish market and is hooked up with the best of the day’s catch. 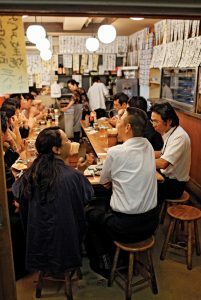 The result is an endless menu of seafood, everything cooked perfectly and dirt cheap — no dish costs more than $5; and an overflowing glass of cold sake can be had for $2.50. It is all the excuse in the world to let yourself go, to order more than you should, to drink just a few more glasses of that sake, to sit back and watch the joy that surrounds you as a dish of grease-free, awesomely crunchy fried tuna is slid in front of you. The space is made up of two counters shaped like an elongated letter U’s. Diners sit on stools on either side, while two waitresses, service a counter each, hustling up and down the center, taking orders and delivering food and drink. Hustling may not be the right word. Both waitresses are in their 70s, maybe late 70s and they are kept busy as Uosan Sakaba is packed from 5pm until they close at 10pm. One of the women is a bit of a dragon lady, long, dyed hair pinned up in a youthful style, her clothing perhaps a touch inappropriate. She has long ago cast away the servile politeness of most Japanese restaurant staff. She snaps at you if order when she isn’t ready, and lingers a bit too long with her old-time customers. No matter. It is part of the charm, and when she warms up to you, a certain flirtatiousness appears in the hints of a smile. You can order from the wide-ranging specials, but dishes are also paraded out a la Dim Sum style: a box of uni, a grilled mackerel, sea cucumber sashimi. The last time I was there, we went a bit nuts, fried aji, yellowtail collar, semi-fatty tuna sashimi, shrimp tempura, grilled eel “guts”, sea pineapple and a few more dishes that are hazy in my memory. Everything was perfect, perhaps a bit rough-hewn, but absolutely perfect. A joy swells in such an atmosphere. The guy to your left asks how the eel is? The woman to your left gives you a “kampai”. You order one more beer, spill your water, laugh at a joke and you feel as if there is nowhere else you would rather be in the world. And in fact, the world has fallen away as if Uosan Sakaba is a ship rolling over the dangerous waters of the outside world — and then you know, that like that salary man, this is what you have waited a lifetime for. Wonderful! I almost feel as if I was sitting by your side. Nice one very nice !! !